When my first amigurumi project completed, I always dream to make one of Sergeant Keroro (ケロロ軍曹) or Keroro Gunsō character. 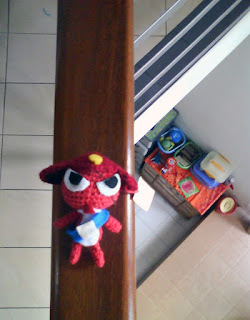 Well, I don't have any green yarn, so I decided to make Giroro, instead Keroro. The stitch on his face was made after I searched Giroro images on google. This one will be given to my friend since we will go to different university. I didn't follow any pattern, but you can find it just like head-body-hands-legs usual patterns. measure it yourself. for the helmet, I made a circle with a half circle for each side. Sorry can't give you the exact pattern, I made it several weeks ago.